Japanese Episode AG 063: "Sorurokku to Hasuburero! Seinaru Mori no Densetsu!!" American Episode 335: "Take the Lombre Home"
Satoshi-tachi are walking along the path to Touka City when they ask Takeshi for a drink of water. Takeshi reveals that their canteen is empty, but promises to quench their thirst when he leads them to a famous lake in the area. Along the way, the Rocket-Dan appears, but a Solrock in the area joins our gang to help ward them off. When the group arrives at the lake, they are dismayed to discover that it has run dry! Haruka spots a village nearby, so the group goes there to look for water. Along the way, Takeshi's Hasuboh stumbles into an empty well, and when it comes out, it randomly evolves into Hasubrero! When the gang arrives at the village, they are greeted by a village filled with people who worship their God of Water, Hasubrero-sama. As everyone busies themselves worshipping Takeshi's pokemon, a young villager named Miyu reveals that the area is suffering from a drought. The villagers blame a Solrock who had landed on the planet about two weeks before, so a hunt has begun for the rock-type pokemon. 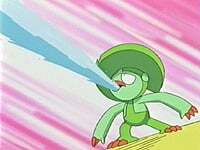 After witnessing the village's rain dance, Satoshi and his friends have Hasubrero perform a rain dance, hoping to attract Solrock to the area. As Solrock appears, Haruka's Eneko comes out of its Monster Ball and runs off, prompting Haruka and Miyu to follow. The two ladies come across a cave, where they find a machine built by the Rocket-Dan that's stealing all of the village's water. When the Rocket-Dan is found out, they attack our heroes with a large robot. Solrock steps up and sends the trio packing, but the pokemon cannot stop its attack! Solrock is eventually stopped by our heroes' water pokemon, and the reaction causes storm clouds to gather! Rain returns to the village, so Satoshi-tachi return to their journey to Touka City. A lot of the people who believe that Kanto was the best part of the series and that Houen is crap point out that a lot of the episodes in Houen are merely pale imitations of classic Kanto episodes. And yeah, there are some parallels between this episode and the old Snorlax episode, "Wake Up, Snorlax." But really, they're only "the same episode" in the broadest sense. Sure, both episodes deal with drought, but the similarities end there. The Snorlax episode dealt more with waking up a pokemon who was blocking the water flow into a village, while this one dealt with the Rocket-Dan stealing water while another pokemon was blamed for it instead. In my mind, the comparison is really unfair. So anyway, I thought the episode itself was alright. Hasubrero's evolution was a bit too random, and I didn't care for Eneko just letting itself out and leading the gang to the Rocket-Dan for no real reason, but other than that I thought it was OK. The dubbed version was alright, but I really wish Rachel Lillis could find a different "old woman" voice to do. The highlight of the dubbed version, for me, though, was Team Rocket's assets line. Solrock keeps its Japanese voice. Whee. Also, the Japanese ending them, Smile, is updated as of this episode to include Hasubrero among Takeshi's pokemon. Then, after the episode's title screen, two more seconds are cut from the pan shot. This cut is more obvious because the music does this weird jump thing in the dub. You know the music the villagers play to bring about the rain? As you may have guessed, it was changed for the dub.